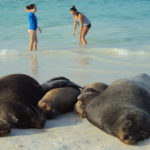 After growing the tour agency for several years, exploring new routes in the mountains and sharing these off-the-beaten track and trails with backpackers from around the world, we were listed in the Lonely Planet’s South America on a Shoestring. 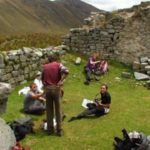 Less than a year later, we were recommended in National Geographic Adventure’s Bucket List for the Condor Trek — a world famous hike that takes you from Antisana Reserve in the north of the country towards the Cotopaxi National Park in Ecuador’s center. 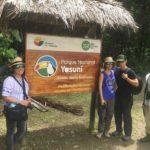 Its great being recommended by such reputable organization’s such as the Lonely Planet and National Geographic Adventure — but the real reward comes from being able to share Ecuador’s beautiful nature with people from around the world. 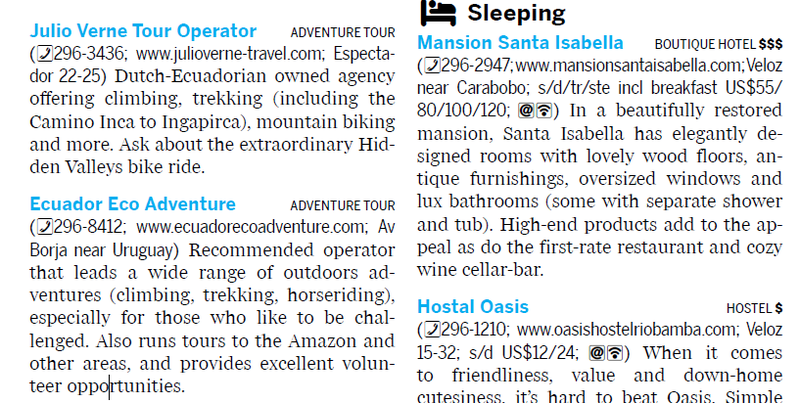 Its worth noting: our address has changed since we were listed in the Lonely Planet. We are no longer located on Avenida Borge y Uruguay and instead operate from the Riobamba Guesthouse on the Cuidadela Politécnica a 15 minute walk from Riobamba’s train station and colonial center. Come join us in our guesthouse for a cabezazo – sugarcane alcohol – and a few beers and good music before a trip into the mountains.